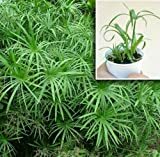 Papyrus plant growing herbaceous of the genus Cyperus also known as Cyperus papyrus, Papyrus plant perennial evergreen and used as ornamental plant, can grow in tropic, mediterranean, desert or subtropics climate and growing in hardiness zone 9+. Stem color is green in the base of the stems is red cover, in end of the stems there is flower that grow. Flower color green to brown like feather, flowers grow on the edge of the “leaf”. 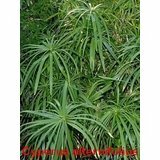 Papyrus Plant Umbrella Palm, 4 Rooted Baby seedlings Fast Growing to 4-5 feet. (GR)~CYPERUS PAPYRUS GRASS~Seed!~~~~~~~Take A Wonderful Trip Down the Nile!